The word fugazza is an Argentinian derivation of the word focaccia, thanks to the significant Italian influence on Argentinian cuisine. But like its name, fugazza is a uniquely Argentinian dish. Fugazza is a kind of pizza, though it lacks a tomato-based sauce and has a thicker, airy crust. It's always topped with a pile of sweet onions, and sometimes with mozzarella cheese as well, and cooked in a deep pizza pan or cast-iron skillet. 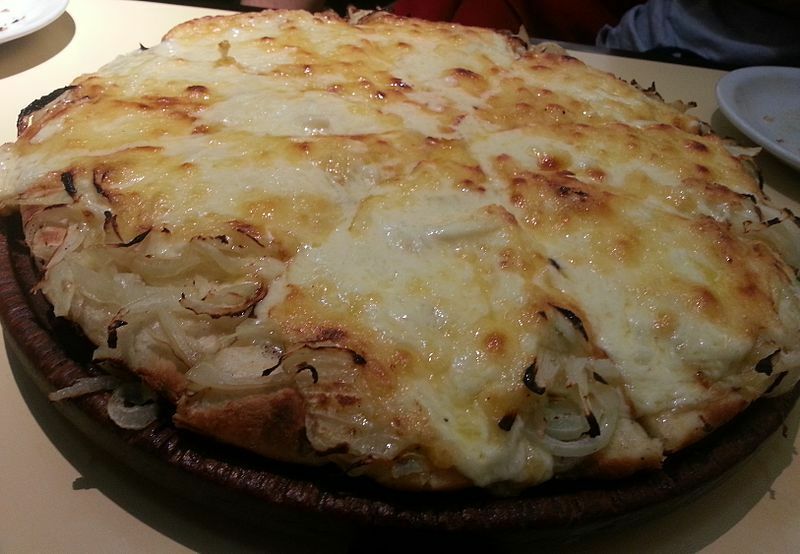 Fugazza is not to be confused with its close cousin fugazzeta, which is a stuffed pizza that is filled with cheese and topped with the same onions. Fugazza makes a great appetizer or main dish. You can add other toppings of course - olives, herbs, ham, etc. The onions are typically not pre-cooked in Argentina, but I like to top fugazza with caramelized onions. Place the warm water (100 to 105 degrees F) in a small bowl. Stir 1 teaspoon sugar into the water and sprinkle the yeast over the water. Set aside for 5 to 10 minutes, until mixture is bubbly. Place the flour, olive oil, and salt in the bowl of a standing mixer and mix briefly using the dough hook. Add the yeast/water mixture and begin to knead. The mixture should come together as a soft, stretchy dough, pulling away from the sides of the bowl. Add a bit more flour if the mixture is too wet, and add a bit more water if mixture seems dry, crumbly, or overly firm. Knead for 5-10 minutes, until dough is smooth, soft and elastic. Oil a bowl with olive oil and place the dough in the bowl. Cover with plastic wrap and let the dough rise until doubled in size. While the dough is rising, peel and slice the onion into very thin strips. Place them in a bowl of cold salt water and soak for 30 minutes. Drain onions well and dry them with paper towels. Once it has risen, punch down the dough and shape into a smooth ball. Pour 3 tablespoons of olive oil into a 14-inch pizza pan with 1-inch sides. Place the ball of dough in the middle of the pan and flatten gently with your fingers. Let dough relax for 10 minutes. Continue to flatten dough into the pan, flattening it and pushing it toward the sides of the pan, letting it relax in between until dough covers the bottom of the pan. Preheat oven to 450 degrees F. Sprinkle the onions over the top of the dough. Drizzle a tablespoon of olive oil over the onions, and sprinkle with the dried oregano. Place the fugazza in the oven. Bake for 15 minutes, or until edges start to turn golden brown. If desired, remove fugazza from oven and top with thin slices of mozzarella cheese and sprinkle with grated Parmesan. Return to oven and bake until fugazza is golden brown and crispy around the edges. Brown onions under the broiler for the last 3 minutes of cooking if desired. Remove from the oven and cut into slices to serve.